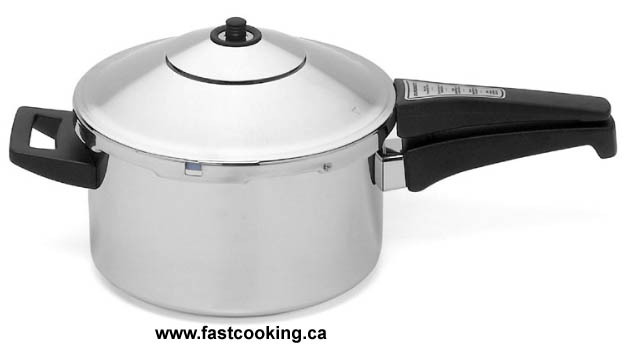 Free shipping on stainless steel Fagor pressure cookers that cook at 15 psi pressure. A Fagor pressure cooker will save you a tremendous amount of time and money. You can make delicious homemade meals lightning fast. The ultimate green cooking tool, it cuts the length of time a hot stove is on, increasing your comfort and reducing your energy use. A 6 litre/quart (the most popular size), 8 litre/quart or 9.5 litre/10 quart capacity, 15 psi DUAL pressure, European-designed, stylish and safe new generation pressure cooker that is extremely easy to use. Made of 18/10 stainless steel with a mirror finish, not aluminum, the Fagor Duo pressure cooker is strong, high-quality cookware. One of the fastest pressure cookers on the market. what separates a cheap pressure cooker from a quality one? Not all pressure cookers cook at the same speed. What are the differences between pressure cookers? Note: We also sell the made in Spain Fagor Futuro and Fagor Chef, Kuhn Rikon pressure cookers in addition to those listed below and Magefesa pressure cookers. The made in Spain Magefesa Mageplus is $173.99 (6 litre) and $189.99 (8 litre). Other Magefesa models with sizes up to 22 litres are available. 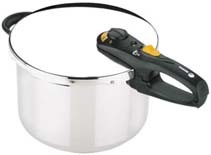 Made in Switzerland Kuhn Rikon pressure cookers are the highest quality stainless steel pressure cookers on the market and are even easier to use than Fagor pressure cookers. E-mail for details. Free shipping to all provinces and lower 48 states. 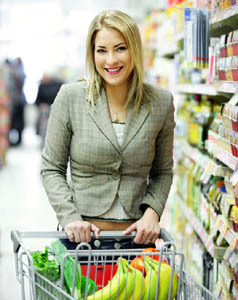 * What size pressure cooker should I buy? ** Learn why the “Maximum Cooking Pressure” affects the price and cooking speed of a pressure cooker. Our website contains extensive information on pressure-cooking. Start exploring by selecting a topic below. On average, cook food in 1/3 the time compared to ordinary cooking methods. 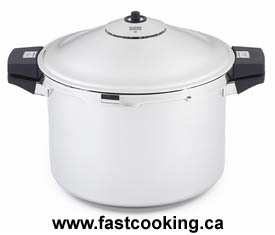 A Fagor pressure cooker at 15 psi pressure can do in minutes what takes a slow cooker hours. That means more time for you. A Fagor Duo stainless steel pressure cooker can cook a considerably greater variety of food types compared to a microwave oven, and unlike microwave-cooking, the food tastes great. With an electric stove, cooking accounts for about 10% of the average home's hydro bill. A Fagor stainless steel pressure cooker will save you money by substantially reducing your energy consumption for cooking by about 70%. This also means your home will be cooler in the summer because of less heat from your stove. If you use an air conditioner, it doesn't have to work as hard, lowering your electricity bill even further. The Fagor Duo can be used with any stove type including gas. You can save several litres of water by cooking corn on the cob in the Fagor Duo pressure cooker using 1/2 cup (125 ml) of water instead of boiling its vitamins away in several litres of water. 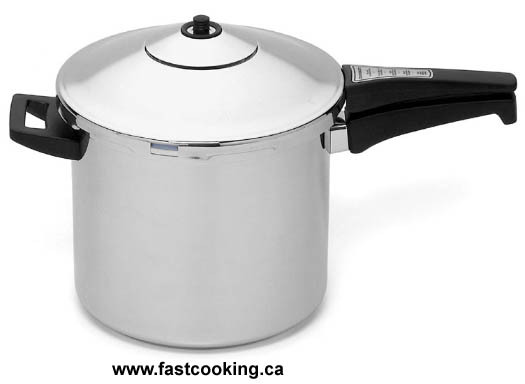 This is one of the lowest amounts of water necessary for any pressure cooker on the market. The Fagor Duo stainless steel pressure cooker will allow you to quickly and easily cook roasts, stewing beef or healthy pulses (chickpeas, dry beans, dry peas, and lentils). Flavourful cuts of beef that take a long time to cook by roasting, stewing or using a slow cooker become tender fast when cooked in minutes with the Fagor Duo pressure cooker. Also, as an alternative to meat, the Fagor Duo pressure cooker is ideal for preparing low cost legumes. Almost all foods can be pressure-cooked with the Fagor Duo stainless steel pressure cooker. See the price and performance table above to compare T-Fal, WMF and Lagostina to the high pressure Fagor Duo and then order your new generation 6 litre stainless steel Fagor Duo pressure cooker for only $116.99 (Canadian/U.S.). Buy two in the same order and get $5 off the price of the second pressure cooker. We ship anywhere in Canada by Canada Post Expedited Parcel. 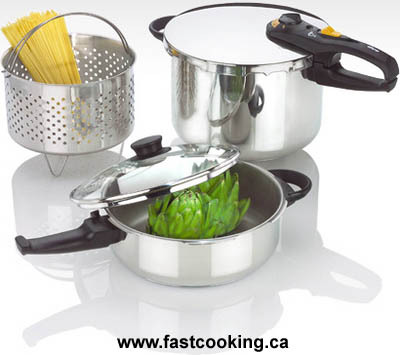 Fastcooking.ca :: the best deal on the best European-designed second (2nd) generation stainless steel pressure cookers sold in Canada. Fagor, Magefesa & Kuhn Rikon pressure cookers available to buy in Canada at The New Generation Pressure Cooker Experts; better than T-Fal, Presto. We ship pressure cookers anywhere in Canada (such as Toronto, Montreal, Vancouver, Ottawa, Edmonton, Calgary, Winnipeg, Halifax). ©2005-2013 Circular Input Products Ltd., All Rights Reserved. Problems or suggestions about website: contact .